I watched your video and in my opinion, Homie bird is not well. The first thing I check when observing a suspected ill or injured bird are their eyes. A healthy bird's eyes should be bright and alert. The bird itself should be alert. Homie bird's eye are dull and lifeless. He is far from appearing alert. And please don't tell me he's 'just tired'. Your theory of Homie bird having a sissor beak is completely off course. He does not have a sissor beak. This is a pigeon with sissor beak. I don't know what is wrong with Homie bird but something sure is. Quite frankly it breaks my heart seeing a bird in the state that Homie appears to be in and you aren't seeking any help for him, rather making videos of the poor bird. Checking and researching 'tropical' bird websites for information on helping a pigeon isn't where you need to be. These are two entirely different types of birds. Please get Homie bird to someone who can help him. No, Jenn, you were not the least bit out of line. In fact, your post was spot on. A dislocated beak and a sissor beak are two different issues. Sissor beak is when the upper and lower beak cross rather than come together. The bird is still able to open and shut their beak. A bird with a dislocated beak would probably not even be able to open and close it. And it would also probably be quite painfull. Think of it as your jaw being dislocated. Could you post a close up (still shot) of your bird's beak? Scissor beak doesn't happen out of the blue, neither does it appear and disappear in turns. Birds are born with it, and it may gradually become more visible until they are about 3 weeks old. After the age of 4-5 weeks the beak has hardened considerably, and it may be too late for binding or manipulation. 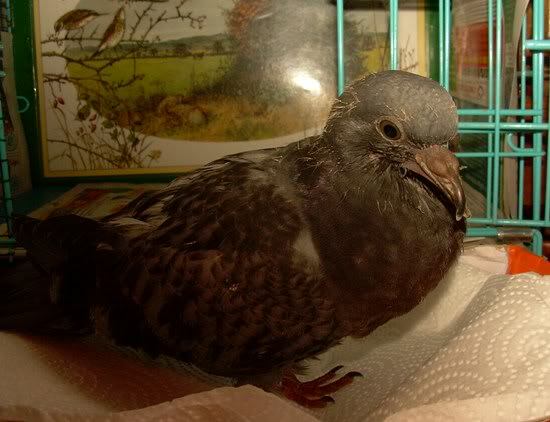 You can't, simply can't, "cure" scissor beak in a couple of days, on an 11 week-old pigeon! You shouldn't post a misleading and potentially harmful "teaching" video on YouTube! Look at the PERMANENT misalignment of the jaws and the tip of the beak on PIGEONS with proven scissor beak!!!!!!! WHY ARE YOU SO STUBBORN ???!!!!!!! Ain't I talking about the advice, Ain't I work at a pet shop that has expert vet, with nursing dedgree's? Why would you say i brush this asside as trash I wouldn;t be posting if I didn;t have something to listen to. You've mistaken me for someone else. and why you say I experminating ,. Pigeon is not loney he sits beside me all day, And i still own his Mother! She will be released when spring arrives and theres more food. This is my Bird Homie, There may be many other cases out there and to people reading this for farther infomation on bird issues. Don't take every bird as Homie is. Homie has wild parents, He is very strong unlike most tame birds. This tame bird means bisness. NOT wild, FERAL! You've been told often enough before there's a huge difference, don't bend the facts! I guess I don't really have much else to say from the previous replies. What am i suppose to do. Prove to a bunch of admins? prove what I told you i have no proof from the dislocations because the issue has been resolved. I don't need you to prove anything except that Homie is well, and safe from harm. I have seen a couple of your vids on U Tube, and Have to say that your bird doesn't look well. He acts and looks as though he is sick. And it looked as if there are feathers missing on his neck? The shower vid was upsetting, as he was obviously frightened. You shouldn't be using cat and dog flea shampoo on a pigeon. You can buy a bird spray from the pet shop. He wouldn't have fleas. He would maybe have mites or lice. But shampooing is really not necessary, and I'm sure a bad experience for him. He isn't a puppy for Gods Sakes. Also have to agree that a beak is either scissored or it's not. It doesn't go in and out. Unless it is dislocated, in which case, it would be extremely painful for the bird to have you massaging it. Do you even think about the pain he could be in, or how frightening all this is for him? When you selfishly place YOUR own knowledge above that, of a Dr. who has been educated in Veterinary Avian Medicine, then...... all you seek; is the attention YOU ARE receiving. Which is sad. Because you refuse to believe that anyone knows anything more than you do. Instead of focusing on HOMIE..... you have spent days now, neglecting what HE NEEDS, which is care that you are not providing, INSTEAD YOU have done what YOU "think" he needs! How many people do you need to tell you that he is SICK... and YES...please.... I wish you would-------> DO A KINDNESS BEFORE it is TOO LATE. At the end of the day will /or/ would you be able to say you have done EVERYTHING POSSIBLE to help Homie to be healthy. Because right now... the answer to that is No. Sad, if you ask me. I could Care less about what has been said PRIOR to All of this. WHAT I care about.........NOW.......... is that you get Homie help. HOMIES---LOOK OUT for Homies!!!!!!! and I'm TELLING you, HE IS NOT- NOT- NOT- NOT WELL! --->>>>> HE needs help. NOT massages! Please. Just stop. I have no doubt what so ever that you love animals. For me, it began when I was just a little girl, 4 years old. My mom and dad ran the rescue mission on skid road and I was there with them from sun up to sun down. The first pigeon, that found he's way to my path, had been poisoned. At that time, the police threw out poison laced cracked corn to control the pigeon problem. They died horrible deaths. So it was, the first pigeon I found died in my 4 year old arms.My mother told me that if I had enough faith, the pigeon would be cured At the time, I told myself that some day I would help all the pigeons I could.I've kept that promise for decades. I've come to understand, that God wants us to be his partner and take advantage of the resources available to us. From looking at your videos, I'm very certain your baby has a canker infection. It's so common with young pigeons that I always treat them often before they are weaned. I have plenty of medication, from my rehab, and I would be really happy to share some with you so you can have your own first aid kit. When I began my journey, the internet had not been invented and information on pigeon illness was very hard to come by. You are so lucky to have resources that myself and others did not have. If you email me your address, I will put a kit together for you complete with the instructions I have come to use. So sorry to hear that, It saddens and anger's me, The feds here have programs to , To depopulate the pigeons, They just release hawks. or monitor hawks. I know the hawks aren't fully "wild, or feral" whatever u wanna call it. so i get where ur coming from, Shouldn't a canker be visable inside the birds beak tho? I have not seen such a thing on Homie or before of my 20 yrs of raising and breeding pigeons. The mother also has baldy type look to her around her eyes. Is it possible for that to be just a genetic thing? Your story is very touching, This still goes on to today. Funny because Pigeons get blamed for all the diseases. But in all honestly I don't believe the pigeons would have these types of bacteria if it wasn't for us Humans , We have to do everything we can for these birds. I took a little break from this site not even a week and Im back lol, I really like it here. I dont ignore any of your comments. And sorry if i got mad the last phew days. Its just I do everything I can for Pigeons, Only person to pad me on the back is my g/f and myself. I do alot for birds that most people i know couldn;t even think of doing. Homie's Father "peter pan" was found at a bar by two drunk old guys, that were gonna bring him into the humane society. when i brought him Home. 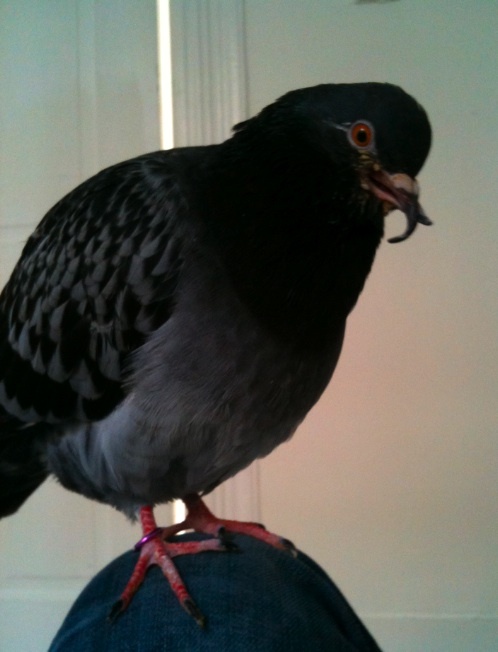 I pretty much teared of joy having a pigeon again felt so good. Proves Pigeons will never leave me lol, Im laughing because they will never leave us all, they here forever, no poison, no hawks will ever destroy the powers of the homing pigeons. Deeper you go the less funny it is. I just really honor the birds and Pigeons. Pigeons specially. Canker doesn't always show in the mouth of the bird. That is only one symptom. There are many, and feather loss is another symptom. Well, in watching the videos of your bird, it's pretty obvious that he isn't well. Why you can't see that is beyond me, but he definitely isn't well. I feel badly for him, as you would rather argue that point than try and learn something and maybe help him. So trying to reach you seems pretty pointless. I'm not blasting you. I said your bird isn't well. He's not. Why do you not want to believe us? I am starting to put a blanket over his cage around this time 5 - 6pm, so he gets a good sleep threw the evening. I exersize only once a day , just bring my hand down while he is perching on my finger, so he continueiously flaps his wings, I do this 10 - 15 times, Depending how tired he gets after. Cant really think of anything else to say....but if i think of some problems that i solved, Ill post em up. I didn't say that you don't care about your bird. I know you care for him. I just said that he is not well, and you won't listen to us that would pick that up right away. A good diet is important of course, but it doesn't prevent canker. Stress or other illness will bring on canker. And I don't understand why you are removing the seeds that have shells. Most of what they eat has shells. It gets ground up in their gizzard. That is what they were made for, and why you must supply grit, as it helps them to grind up their food. Chris...I think you are a loving kind person, that wants absolutely the best for your pigeons. After all, there are many young men that would go out of their way to help a animal in need and especially a pigeon. Personally, I am swamped with rescue birds. Just this year that ended, I have given aid to close to 600 pigeons. The underlying cause of most illness is canker. Birds get canker via the egg and hatch with it or get it via hand feeding form the mom and the dad. One of the tale tell signs in babies under 30 days old, is the lack of feathers around the face and beak. If the canker isn't treated, other conditions the baby may have inherited from mom and dad, can be quick to emerge. Often young birds will become so bogged down, as their immune system is not developed, that they cannot survive. A natural defense of birds in general is to pretend to be well until they can no longer pretend. When they can't pretend any longer, often it's too late. Those of us old gals that have been tending to pigeons long before you were born only want what you want. We want your pigeons to thieve and be happy in your care. Also, we don't want you to have the broken heart, that many of us have had, because we acted too late or didn't know what to do. I treat every baby for canker as recommended by all the pigeon veterinarians. Even on the remote possibility your baby does not have the canker parasite in his system, treating him will not hurt him. My offer still stands to share medicine with you. I must admit to something else too, I really didn;t want to admit to this, because im afraid of everyones reaction, But i pulled 2 feathers from his tail, just last weekor week before, They were roughed up from being in the smaller cage, They were just really bad shape feathers. I am greedy for doing this, And i really should of waited until he was much older, His balance is really off. The new feathers have made there way already and forming stronger, I just make sure his tail rests above something, His lower perch does well. Im sorry for pulling the tail of a young bird. I really shouldn;t of done this, i feel bad so plz be gentle with your comments, I was gentle wit the feather pulling.....Am I in trouble? I mean like I did something really shouldn't of done. Sometimes feathers break and its good thing to pull the tail feathers . Just the tail feathers. But not young birds idk what made me do it. Im guessing greed because i wanted him to be the best, I spend all my time with him. He won't even have chance to slip, Im right beside him 14 - 16 hrs a day.....Damn I really didn't wanna mention i pulled his tail feathers. But im a honest person, I dont mind if you guys give me trouble for doing that. Im just going to be there for Homie, And listen to you guys, I know you are the experts. I may have had 20 yrs experience, Ive rebuilt a pigeon coop too because of hollow floors. Ive had 40 pigeons and 10 doves (most ive had at once). They are much stronger outside in their coop. Indoor pigeons need exersize Like ELMO, U ever seen Elmo on You Tube? Elmo has tons of room to exercises obviously these people have no cats to worry about. My cats have been excellent behaviour around the birds tho. Im guessing over time they will be perfect .....still nature stands tho, cat gets a bird its the nature. But its my nature to protect the birds too, So ....these cats won't stand a chance of doing anything to my birds. Chris...pigeons need protein, especially baby pigeons. They get protein from peas. Most of the pigeon seed mixes contain several different kinds. Also and unlike parrot types, for those members that don't know, pigeons eat theri seed whole. Chris...I thought I share my pre-written feeding instructions. I wrote them up to have handy to share with folks that aren't as experienced as you. If your baby was here, I would feed peas rather than the pablum. If you run across others that have young pigeons you can share this with them. These instructions are for baby pigeons that are already mostly feathered. You can hand feed defrosted peas. Run some hot water over them until they are defrosted and slightly warmed. Put the bird on your lap and hold it next to your body. If it helps because you are having a hard time handling the pigeon, you can wrap a towel around it or put it in the sleeve of a tee shirt, with the head out the wrist. This method confines the pigeon without hurting him and makes it easier to handle. Gently open the beak and pop a pea at the back of the mouth and over the throat. It gets easier and faster, with practice, for both you and the bird. You will need to feed 30-50 per feeding [depending on the size of the pigeon] and every time the crop empties until you know the baby is eating on his own. After a couple of feedings, most squeakers get the hang of it, pick up the peas on their own and naturally transition into a seed diet. This is a wonderful method for teaching babies to eat because they feel the whole food in their mouth and it’s soft and easy to pick up and hang on to. The crop is located right below the throat and with food it fills up like a little balloon. The peas make the crop feel lumpy and squishy. My girlfriend did that with Corn today!, Seems like we are in the right direction, You guys do help alot, because its always better to get a second opinion. But is Corn good too? Ill defrost some peas tommorow, and get on that, I also have farm markets around here that will have various types of whatever i need, Its really good here in Hamilton Ontario for food markets. Everything else is SLUM tho, pure SLUM. This city has nothing except depression, crackheads, mugging thugs, (i got mugged already only lived here 1 yr) The stores are all poor, If i have to get pigeon feed i must travel. I hope things pick up around here in this city, Its brutal. Chris...the peas have the protein the baby needs. The corn seems to be more difficult to digest. It's really important to get enough in to them. Be careful when you go to the feed store. Where did you move there from? He seems to trust me very much, I can do anything he is cool, as long as i approach him in a relaxed manner, he does not hesitate (first time a pigeon has ever done that with me) Im guessing once he grows up he will be tamest pigeon i ever have raised....I really hope he will be ok from all this stress. Ive dropped seeds in his beak before, I always get Pigeons eating on there own, Its pointless for this bird to eat on his own when the seed i have for him has mostly shell seeds. Stupid pet stores. Cant even get seed with corn in it!!!! Pigeons are supposed to eat seeds with shells on them. As for the peas, frozen peas would be better than canned because of the salt used in the canning.